…did I travel to Bar Harbor for groceries, two days before the 4th of July. Holy instant crowded summer scene! The trip was tempered by a very manageable number of customers in the hardware store, and by scoring some 6 packs of annuals on sale at Sunflower Farm on route 3. There are plenty of activities happening on the island tomorrow and Monday, so I’m not sure when I will get a chance to further explore the possibilities of the goodies I bought from Kate McKinnon’s excellent sale last week. 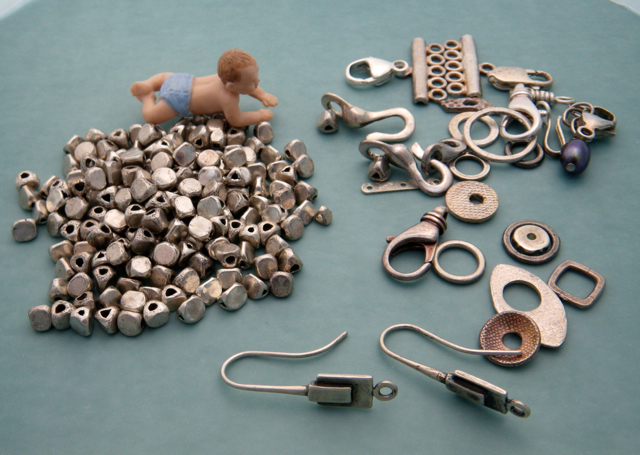 I know exactly what I want to do with some of those triangular Thai silver beads. The rectangular earwires will convert to earrings in minutes with some of my own silver dangles. As for the other bits and bots, who knows how they will come in handy, but they will. 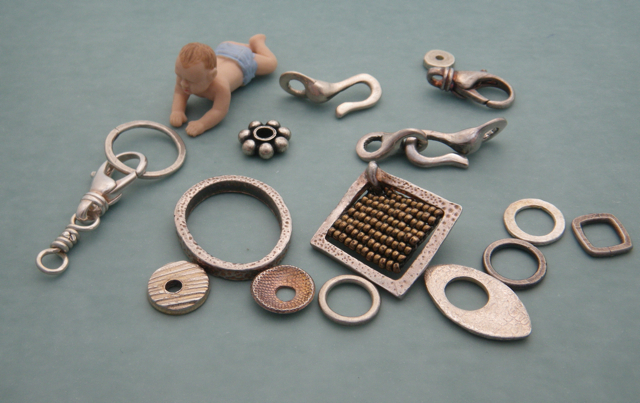 Could I have made these pieces myself? Yes, of course. But sometimes it stirs up the creative energy to add someone else’s components to the mix. 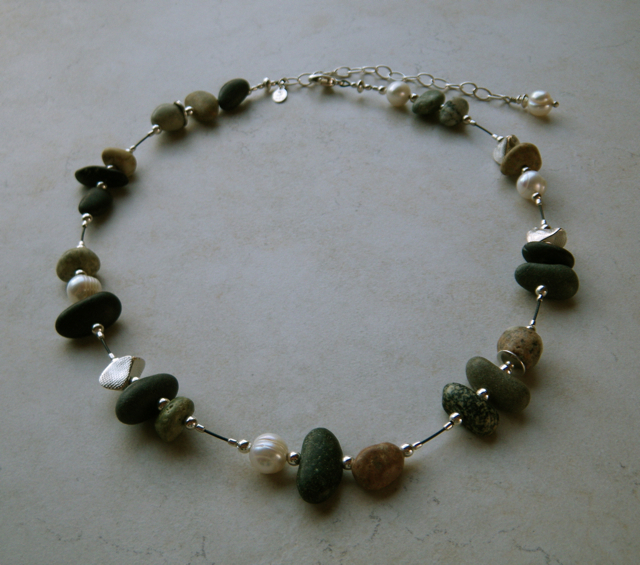 One of my all time favorite beach rock necklaces has three fine silver beads that were made by Kate. Though I make plenty of beads myself, Kate’s beads were just the shape and size I needed at the time to complete this particular necklace. 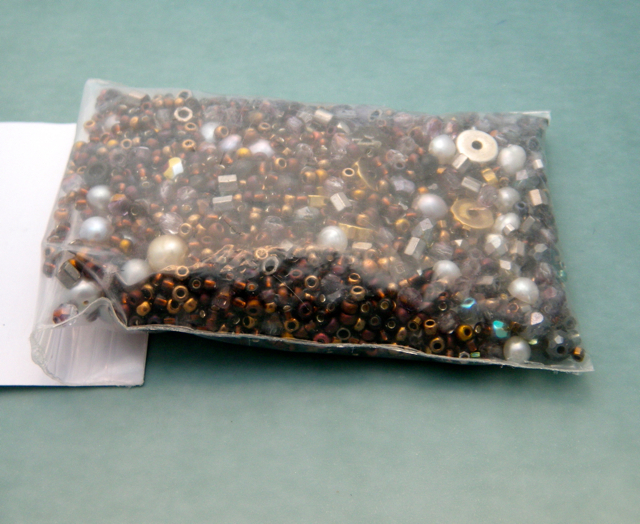 (This is not the greatest photo, but you can spot the beads at about 2 o’clock, 3 o’clock, and 8 o’clock.) I’m glad my friend Donna Isaacs ended up with this necklace, because I get to see it quite often. And I’m going to toot my own horn here (not comfortable for me to do) and say that the necklace looks FABULOUS on her! 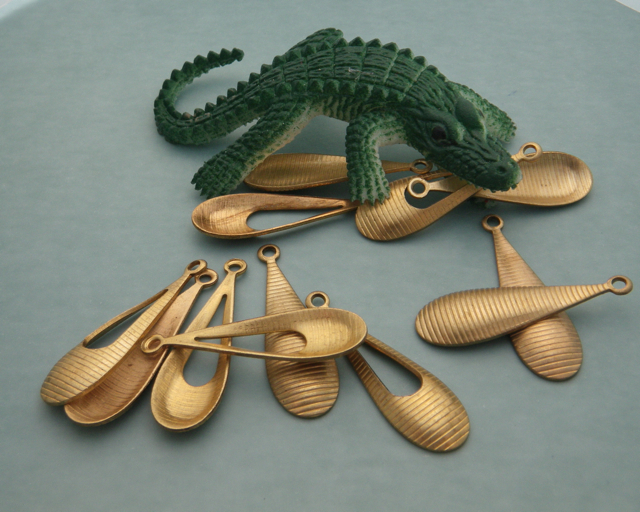 I have a batch o’ things I plan to patina, next week, including these brass paddles. Kate added little surprise goodie bags to the orders she sent out from this recent sale. 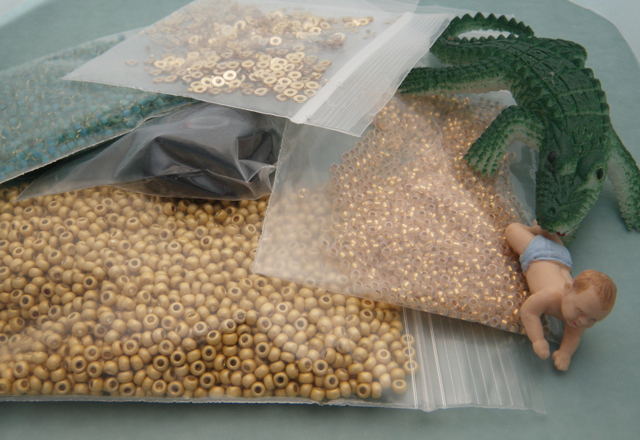 Eventually I’ll use the seed beads, and there are plenty of other little treasures in there that I haven’t even taken out of the bag. I’m just not quite sure what to think about the word “colourway.” It reminds me of the word “henway” and a lame joke. When I came upon “Colorway” I thought, oh lucky Barb, she gets to use special beading jargon, tossing it off without thinking twice. Come to find out a few sentences later that it was with reservation. Evocative word in any case. “One of many various configurations for the color scheme for shoes. For example, Blue/White and Black/Red/White are two different colorways for one shoe model. The term is not limited to shoes, but that is the most common usage. Commonly used in skateboarding. I think I just made friends with the word! I’m glad you are back on the east side of the country. What’s the colorway of today’s painting?